UK Items are delivered by Royal Mail. 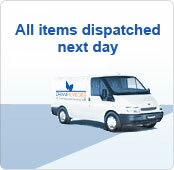 We will dispatch all in stock items the next day working day. Please see our product listings for information on how to use, ingredients and general product background. In the unlikely event that a product needs to be recalled, all customers would be contacted by email with appropriate details. We take your data privacy very seriously. Your personal information will never be sold, rented or otherwise passed to a third party without your express permission. All transactions are handled via our secure server. Please see any of our products for our excellent customer feedback!